But what about me? I mean, I know I don’t necessarily look like a princess. I’m not as beautiful as Sophie, or as kind or as sweet. But I’m just as intelligent—maybe more so! I did way better than her in the spelling bee! And I get better grades than Sophie in math and science! Plus I’m a very good actress. At least, I think I am. True, I only had that one line in first grade. 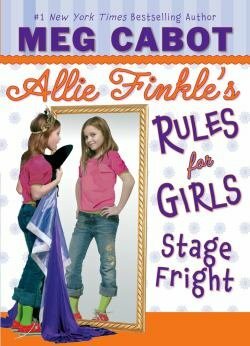 Meg Cabot’s Allie Finkle’s Rules for Girls series is inspired. She features genuine, amiable girls who do not obsess over the latest fashions and make-up and pre-teen movie and television stars. The girls do not constantly talk on the phone and they speak normally. Complete sentences and decent grammar, even. And this is not to say that everything is perfect. There’s jealousy, envy, and some cruelty in the fourth-grade. This is okay. It’s all a part of growing up and the manner in which Cabot addresses it all is so refreshing. Cabot makes me really like these girls and to also want my niece to read these books (she just turned eight). These girls are smart, do well in school, and deal with any complex issues with very mature methods. Allie Finkle likes to make rules and that works for her. Allie is a well-adjusted girl with loyal friends—Caroline, Erica and Sophie. She can talk to her parents and although her little brothers can be annoying [as little brothers are when you’re nine], sometimes they help her. In Stage Fright, Allie’s teacher, Mrs. Hunter announces that the class will be putting on a play called Princess Penelope in the Realm of Recycling. [Okay brilliant idea to bring recycling into a book about putting on a play. It’s fun and readers will learn a few things or think about throwing away a bottle or not using a reusable bag.] Of course, all the girls in the class want to be Princess Penelope because they think that is the most glamorous and greatest role. There’s a popular girl at school, Cheyenne, who Allie does not get along with but that’s because Cheyenne is stuck-up, selfish, and mean. She assumes the role will be hers, nearly by default. Allie finds herself in a huge conundrum when she must audition against her friend Sophie, who ends up with the part. Allie is cast as an evil Queen and she’s terribly disappointed until her uncle explains that this is an integral role for the play and she needs to make the most of it. So Allie dives in and does her role with gusto. When Sophie lets the role of Princess Penelope go to her head, Mrs. Hunter kicks her out of the play. But Allie will not let her best friend down and comes up with a plan to save the play and the dignity and feelings of her dear friend Sophie [and knock Cheyenne down a few pegs]. Stage Fright is a fantastic story. Popularity isn’t important. Being a kind and thoughtful person is. Swallow what’s in your mouth before speaking. There’s no kissing in fourth grade. It’s wrong to hate people. It’s always better to have things out in the open than to let them fester. It’s rude to interrupt people. You can’t make someone with a bad attitude about something change her mind and have a good one. When you know the right thing to do, you have to do it. Nothing is impossible, if you put your mind to it. Nothing at all. This entry was posted on December 5, 2009, 18:30 and is filed under Books. You can follow any responses to this entry through RSS 2.0. Both comments and pings are currently closed.